Graff, Gerald, and Cathy Birkenstein. They Say / I Say: The Moves that Matter in Academic Writing. Fourth ed. New York, NY: W.W. Norton, 2018. 328pp., $29.98 paperback. Two highly qualified academic practitioners produced this work. First, Gerald Graff (Ph.D., English and American Literature, Stanford University, 1963), is Emeritus Professor of English and Education at the University of Illinois at Chicago and former president of the Modern Language Association of America. Graff’s co-author, Cathy Birkenstein (Ph.D., American Literature, Loyola University Chicago, 2003), is lecturer at the University of Illinois at Chicago, and teaches freshman-level writing and English courses using the book as her central recourse. Both Graff and Birkenstein, who are husband and wife, have lectured at numerous institutions over the years promoting the concepts and templates which make up their best-seller, They Say / I Say, now in its fourth edition and sixth printing. The book aims to assist the budding writer in developing a critical mind that truly listens to the various sides of an argument before putting pen to paper in order to crystallize their own position on the matter. Indeed, the art of active listening before arguing has an ethical dimension, something the authors point out in their preface. As such the “they say / I say” approach to writing offered by the authors, “Asks writers not simply to keep proving and reasserting what they already believe, but to stretch what they believe by putting it up against beliefs that differ, sometimes radically, from their own” (p. xxiii). The entire book aims to help in achieving this goal and “To demystify academic writing by returning it to its social and conversational roots” (Ibid.). A unique contribution the book makes, that others devoted to academic writing do not, are the offering of actual templates for the student to use covering just about any writing project they may encounter. These templates, spread out over the book’s four parts, are intended to assist the writer in various situations germane to academics such as how to summarize (pp. 30–42), how to quote others (pp. 43–52), how to respond to objections and naysayers (pp. 77–90), and how to provide one’s added commentary—something the author’s call, ‘metacommentary’ (pp. 131–140). Moreover, the authors do not offer templates solely dealing with how to disagree with others properly. Because there is certainly an ongoing conversation in which the writer engages, he or she will find opinions that do at times concur with their own. As such, the book also provides templates on how to agree with others while still maintaining their own voice (pp. 59–65). The final part of the book (pp. 162–242) zeros in on specific academic contexts such as in-class discussions, online dialogue, as well academic writing in specific genres such as literature and the sciences—with brief templates provided for all of them. Finally, sample readings are given at the end of the book that exemplify the principles suggested throughout the work, followed by an index of all the templates suggested (pp. 243–294; 309–327). There is no mistaking exactly what the thesis of the book is, since the authors are relentless in presenting it. That the academic writer is to write their arguments cognizant of entering an ongoing discussion is scattered throughout just about every chapter, along with how to do it critically, fairly, and respectfully. This latter aspect is especially important as the authors themselves maintain, “The central piece of advice in this book—that we listen carefully to others, including those who disagree with us, and then engage with them thoughtfully and respectfully—can help us see beyond out pet beliefs, which may not be shared by everyone” (p. 16). 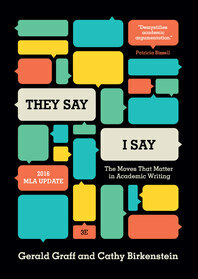 Each template and surrounding narrative in They Say / I Say helpfully assists in fleshing out this central thesis, and because of that, it can be safely concluded that the authors undoubtedly achieved their own purpose—and do so in an engaging style. What one is left wondering, however, is just how useful their templates are for the busy academician actively engaged in critical scholarship. In other words, while the book certainly achieves its own end, does that equate with the professional academic writer achieving their end by using the book’s advice? To this potential critique, it can be answered that the primary target of the book’s audience is the student-writer, not the professional scholar or critic. Throughout the book’s preface, for example, the authors use various terms that are germane only to high school, college, and graduate learners—for example, “student,” “class discussion boards,” and “course packs”—making clear for whom the book was written. Further, Graff and Birkenstein, who are both college professors, repeatedly point out that it was their classroom experiences with students that helped inspire most of the content. Thus, while the active, professional scholarly-writer can certainly pick up some new gems from the book’s templates, the book is still, nevertheless, targeted at those writing at the non-professional, student-academic level. Another possible critique may center on the seemingly repetitive, mechanical templates that some might view as not actually inspiring critical thinking or originality, but rather providing a mere formality for the student to incorporate without serious reflection. The templates’ “repetitiveness” notwithstanding, the authors do hit this potential objection head-on in both the book’s preface and introduction. Rather than the templates taking away from a writer’s own voice or critical thinking, the authors present these them as tools for budding student-writers to be aware of the key rhetorical moves that seasoned writers pick up on subconsciously. Further, the authors do encourage students to “modify and adapt” the book’s templates into their own particular contexts thereby guarding the writer’s individuality. “Ultimately,” contend the authors, “creativity and originality lie not in the avoidance of established forms but in the imaginative use of them” (p. 14). If anything, these potential critiques underscore the book’s overwhelmingly positive aspects. Perhaps the biggest take-away of the book is the need to represent an opposing view fairly, while being sure to imbed the writer’s own position into the ongoing conversation. Chapter two’s “The Art of Summarizing” is particularly helpful here as the authors caution newer academic writers to put themselves in their detractors’ shoes as objectively as possibly for the sake of entering the conversation (or as they borrow the term, “the believing game”). Yet, they are to do so while simultaneously “knowing where [they] are going” (pp. 31–38), thus always maintaining their own end and contribution to the matter in sight. Indeed, keeping both goals in view is vital in presenting a robust, well-balanced critique, making They Say / I Say a valuable recourse for students and academic writers at all levels.